"You go off the reservation, I will not come after you." Nathan Muir (Robert Redford) has enjoyed a lengthy career as a CIA operative who tackles assignments all across the world. The years have flown by, though, and the time for his retirement has arrived. Will this be an uneventful day with no major incidents? Not likely. His pupil and one-time good friend Tom Bishop (Brad Pitt) now faces execution for espionage after failing to break out an unknown captive from a Chinese prison. The cowardly CIA office executives appear willing to sacrifice the rogue agent for larger goals, so Muir must work alone to gain his release. Unfortunately, Bishop's time is running out, and less than 24 hours remain before the fateful act will occur. 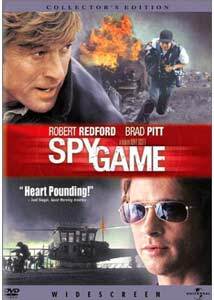 Spy Game intricately utilizes flashbacks to reveal the close relationship between the two agents and the events of this day. Meanwhile, Muir employs varied tactics (with erratic levels of success) to save Bishop while keeping the spineless CIA bosses off his trail. The prominent member of this group is Charles Harker (Stephen Dillane, Welcome to Sarajevo), a younger figure who regards Muir's old-style tactics with disdain. Saving Bishop will require him to outsmart opponents both in the United States and abroad. Much of this story takes place in the past from 1975-1991, and events move quickly from one time period to the next. Director Tony Scott (Top Gun, Enemy of the State) must perform the difficult juggling act of maintaining an easy flow between the jumps. The plot remains balanced most of the time, but the music-video style camera work sometimes renders the action less interesting. It seems tougher to form a connection with individual characters when they appear for only a few seconds within jump cuts and chaotic film devices. While this style worked nicely for Enemy of the State's frenetic action scenes, this tale does not have the same type of intensity. It does feature a monster explosion and some impressive action scenes, but they are not the primary focus. Instead, the relationship between Bishop and Muir takes center stage and rises above the other activities. Muir first spotted the talented young Bishop during sniper duty in the Vietnam War. Their relationship is amicable from the start, and they become close friends during the challenging training sessions. These early sequences are some of the best in the film and showcase the chemistry and charisma of both actors. The pivotal moments occur during an assignment in the war zone of Beirut during the mid-'80s. Muir looks at the larger picture, and has the ability to disconnect his emotions from grueling tasks. Sadly, Bishop cannot turn off his conscience, and a violent disaster creates a permanent rift in their relationship. Complicating matters even more is the presence of Elizabeth Hadley (Catherine McCormick)�a foreign aid worker who falls for Bishop. Her personal involvement in this environment could jeopardize both of their lives permanently. Today, Muir must face similar moral contradictions while deciding how to respond to his former pal's awful predicament. It will take all of his talents acquired over the years to outsmart his bosses and save his own skin in the process. Spy Game would fall to pieces without the unparalleled presence of Robert Redford. There are too many holes in this story for it to succeed in the hands of lesser actors. Redford embodies Muir with tremendous intelligence and the wits to react to nearly every situation. His age-lined face conveys the difficult pressures faced on each assignment throughout his career. The events unfold through his eyes and memory, and identifying with Muir is crucial to enjoying this film. Pitt provides impressive depth while playing a thinly-written, one-note character. Dillane is wonderfully slimy as Harker, and McCormack also injects Hadley with a nice complexity in a brief number of scenes. However, this story rises and falls with Redford. He keeps us interested through several lengthy flashbacks and even overcomes some frustrating direction from Scott. The final result is an above-average spy film that surpasses the limitations of its source material. Image Transfer Review: Spy Game includes a nearly pristine 2.35:1 widescreen anamorphic transfer that offers a remarkable level of clarity. Tony Scott's frenetic visual style would quickly become muddled within an image of lesser quality, so this success is especially refreshing. Virtually zero defects appear on the screen, and even the darker moments lack the usual grain. The bleached-out colors of the flashback scenes could also presents some problems, but they also work nicely on this transfer. Universal deserves tremendous credit for giving this collector's edition release the top-notch visual treatment it deserves. Audio Transfer Review: Tony Scott is constantly cranking up the volume at pivotal moments in this thriller to increase the intensity. While this does become annoying within the story, it does allow the top-notch audio to shine. The 6.1-channel DTS transfer is one of the best tracks I've heard this year. It combines significant power with extensive depth to quickly immerse you into the action. The dialogue is especially clear and understandable, which is pivotal given the sounds that often jump from the speakers. This disc also includes a 5.1-channel Dolby Digital transfer, and it only falls slightly below its audio counterpart. This version is a bit quieter, and the depth suffers a little, but the it still provides an entertaining experience. Extras Review: This collector's edition of Spy Game includes "Clandestine OPS," which gives you the ability to access short featurettes, deleted scenes, and character dossiers while viewing the film. Similar to New Line's Infinifilm series, this feature contains materials on casting, location shooting, and individual scenes. Many of these supplements are not available anywhere else on the disc, which makes this an even more worthwhile extra. Next, there are two commentaries from Tony Scott and producers Douglas Wick (Gladiator) and Marc Abraham. The director's track is informative and covers nearly every aspect of the production. Scott does have the similar low-key demeanor of his brother Ridley, but luckily he does show a more light-hearted side. It's especially interesting to hear him discuss the differences in his chaotic direction versus the more naturalistic, personal approach of Robert Redford. Scott also has a refreshing willingness to note areas where scenes aren't completely understandable. His humble nature and obvious passion for filmmaking makes this commentary worth a listen. Sadly, the producers' track is not very exciting and contains dull plot summary and back-slapping for the actors. Wick and Abraham do seem to enjoy themselves, but much of their conversation falls well short of being memorable. This disc also contains an impressive collection of deleted scenes and alternate takes. Each entry includes the option of hearing insightful commentary from Scott, who explains the reasons for their removal or alteration. Several moments reveal an intriguing past relationship between Elizabeth Hadley and Nathan Muir. While it seems a bit unrealistic, it would have added greater emotional complexity to this tale. The alternate takes reveal one change made to tone down the explosion following September 11th. Although the modifications are fairly minor, they do cause the scene to focus less on the subjective pain and destruction wreaked by the bomb. The alternate ending offers few changes in terms of the plot itself. The final cut is more streamlined and offers better pacing than this version, which is a bit overdone. A two-minute "script to storyboard" piece briefly presents Scott's method for drawing up the scenes on paper before production. His creations pale in comparison to more artistically inclined directors like James Cameron, but they still reveal the beginnings of some key moments. This short featurette reveals a few comparisons between the storyboards and actual filmed scenes, but the multi-angle option is not available. Another interesting bonus is the Requirements for CIA Acceptance, which has several text pages about the necessities when applying to become a trainee. This area conveys a few odd items, including the fact that applicants must be under age 35, and possess a "competence in ambiguous situations." Although fairly brief, this extra does provide a brief glance into the background of a CIA agent. The remaining supplements include production notes, a cast and filmmakers section, and the original theatrical trailer. The notes cover 10 pages, and they give nice information about the basic aspects of the production. The bios portion is well-done, with three pages and extensive film highlights for the main stars and smaller descriptions of the supporting players. The preview trailer appears in the 1.85:1 widescreen format with a 5.1-channel audio track. Redford and Pitt's relationship receives prominence here due to their considerable star power. Following the disaster of The Last Castle, Robert Redford needed Spy Game to succeed and keep audiences interested in his acting career. Luckily, it provides an entertaining ride and includes both suspenseful and poignant moments. Universal has given this disc the royal treatment and included plenty of inventive extras. Their inclusion makes it a worthwhile purchase, even though the film has a few shortcomings.